Front Tires: 110/90 - 16"
Rear Tires: 150/80 - 15"
This motorcycle can get up to 65 miles to the gallon. This kind of gas mileage makes this bike very fuel efficient and economical. This vehicle is the perfect alternative to cars to save on gas and keep extra money in your pocket! 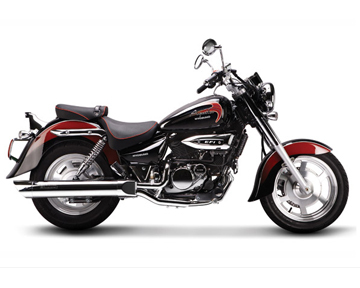 The Hyosung GV250 Aquila cruiser comes with a 5-speed manual transmission, which enables you to ride with maximum power. This Hyosung GV250 Aquila cruiser comes with shut-off switch in case of any emergency. With one press of the button it automatically cuts the engine so you can stop easily. This GV250 Aquila cruiser is equipped with a 250cc 4-stroke V-Twin engine that has a 85+ MPH speed capability. This engine is very reliable and will outlast any other engine on the market.